Small Sherpascopic Podium Steps. UK Delivery. Hire the contractor’s podium step of choice. The Sherpascopic podium steps have long been a trusted and versatile piece of equipment in the construction trade. In stock and available for rapid delivery to site. 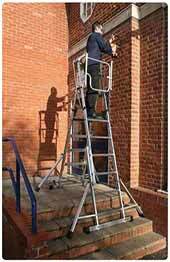 The 4-6 tread Sherpascopic work platform is the range topping adjustable work platform. The 250mm spaced and 80mm deep treads afford comfortable climbing- much like a traditional stepladder, but with the added safety features.